One of the things that I love about Japanese cooking is the simplicity that pervades every facet of it. Most dishes, at their essence, start with a mix and match of just a handful of ingredients and are built from there. Soy sauce, mirin, sake, dashi. You will find a variation on this theme in most Japanese recipes. I find it fascinating that an entire culture's food history is built on the shoulders of such simple ingredients. The difference between peasant food and fine dining isn't so much in the ingredients but in the pursuit of perfection - honoring the ingredients in a flawless fashion. This recipe is part one of two of a Japanese soup called Tonjiru - a hearty cold weather soup with pork and vegetables. It's easy to make and it's perfect for cold nights in the fall. I made the stock but didn't plan on using it immediately, so I froze it until I was ready to use it. 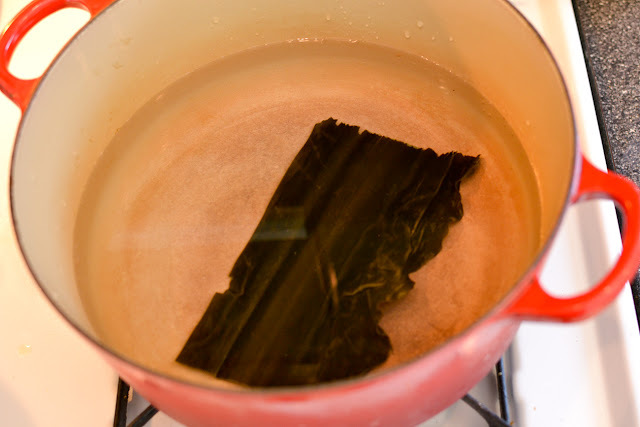 Dashi is a core ingredient in so many Japanese recipes, and it's a simple stock created from just three ingredients: water, bonito flakes, and konbu seaweed. 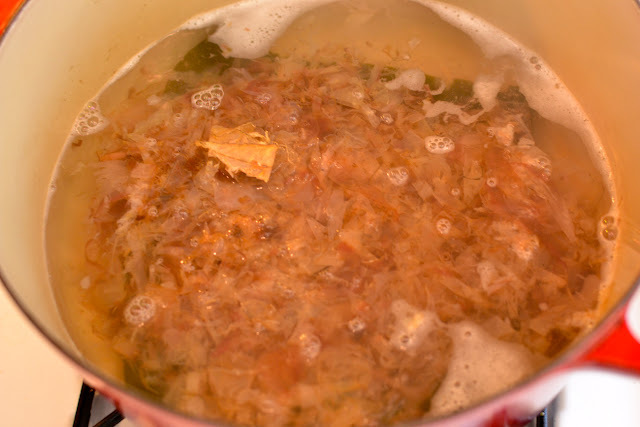 The stock never boiled, it is treated more like a tea - you steep the ingredients in hot water for a period of time and then strain the stock when most of the flavor has been extracted from the ingredients (prolonged steeping will result in off-flavors). To me, the most fascinating thing about this stock is the bonito. Shredded bonito (katsuobushi) goes through a really interesting preservation process. It starts with skipjack tuna, which is boiled in salt water and then smoked every day for a 2 week or longer period. It is then inoculated with a strain of mold and left to ferment for another 2 week period, then sun-dried before mold removal. This fermentation step is performed three or four times, over a several month long period, resulting in meat that is hard and dense and supposedly sounds like wood when struck. When complete, the fish is shredded and bagged and ready for whatever application - be it soup stock or as a topping for okonomiyaki or anything else. Maybe if I can find myself a whole skipjack tuna I'll try the preservation process, but until then I'll probably continue buying nicely packaged bonito flakes. The package that I have pictured here actually is a mix of bonito and mackerel - it was a suggestion of the nice girl helping me at the Japanese market, who said that she preferred the mix to just straight bonito. I'll be honest, I don't know if I would be able to tell the difference in the final stock either way, but I decided to take her advice. Start with cold water, and do yourself a favor and start with purified water. With such a simple stock, the quality of the water has significant effect on the final results. I have read that you can score the konbu with a knife prior to placing in the water in order to more quickly penetrate the flavors of the seaweed but I'm not sure how I feel about that - you're basically trying to score something that is as tough as a piece of hardwood and the threshold between pressing hard enough to score and breaking the seaweed is small. Place the konbu in the cold water and heat the water over medium heat until it just begins to simmer. Turn off the heat and allow the konbu to steep for 12 minutes. Bring the water back to a simmer and turn the heat off again, adding 2 handfuls of the katsuobushi this time. Cover the pot and let the ingredients steep for another 7 minutes. Strain your stock and you are done! 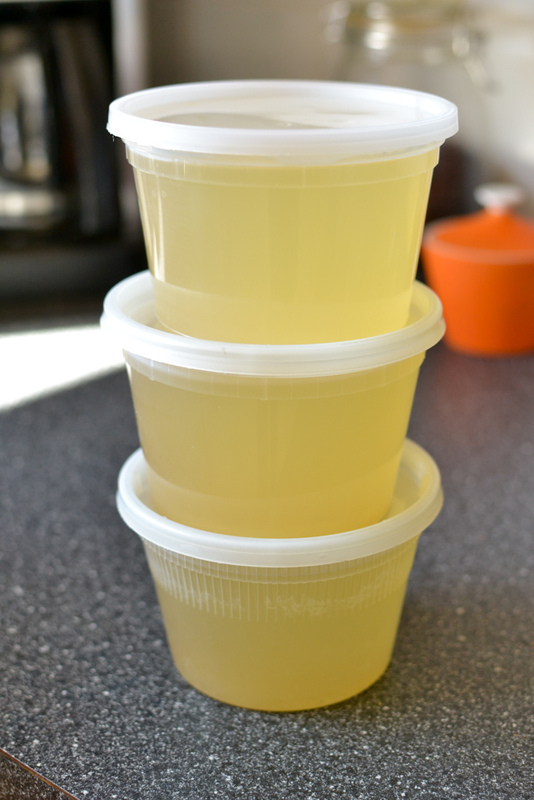 I portioned mine into plastic containers to be frozen for when I make tonjiru. 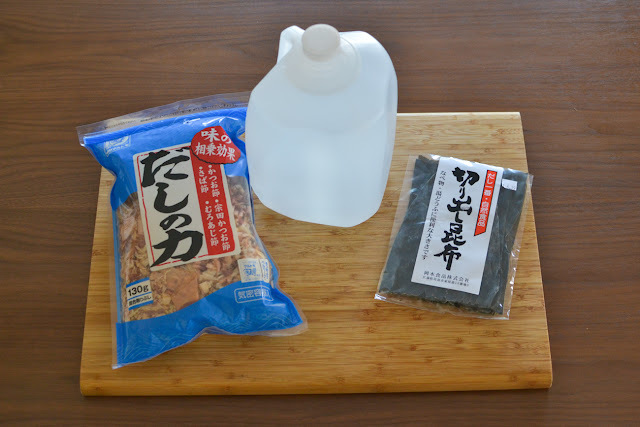 I learned to make Dashi at a soba noodle making class, very similar recipe to yours. Amazing how that big bag of bonito cooks down to next to nothing. Our stock turned out quite a bit darker, I'll have to dig up the recipe to see what might be different. yeah i'd be curious to hear what was different. i think the picture is a little misleading since it's kinda backlit but the stock wasn't anywhere near the darkness of say a brown chicken stock or anything. tastes like dashi though! hah.